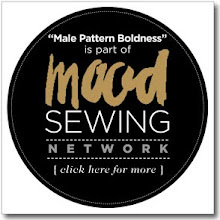 male pattern boldness: Draping Round-Up: WEEK 2! 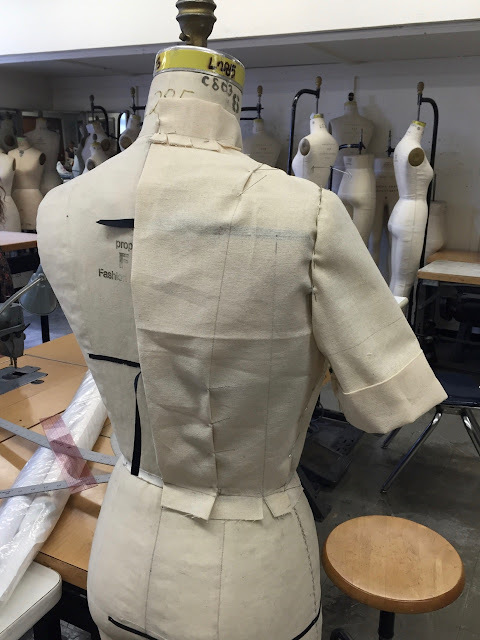 Just as we did when we were draping the skirt, we started by ruling the center front (and back) on a piece of muslin. Instead of the hip line, for the bodice we ruled the line across the apex of the bust. We measured these points on our dress form (First pinning black style tape to identify the positions) and transferred the measurement onto our muslin. For the back, we also ruled across the widest part of the back. 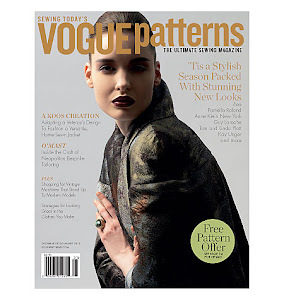 We always added a pinch of ease and, parallel to the center front (or back) we ruled the grain guideline (aka grainline). The grain guideline must be pinned vertical. Did I mention each piece of muslin must be blocked? That means that the corners must be squared (with the aid of a T-square). 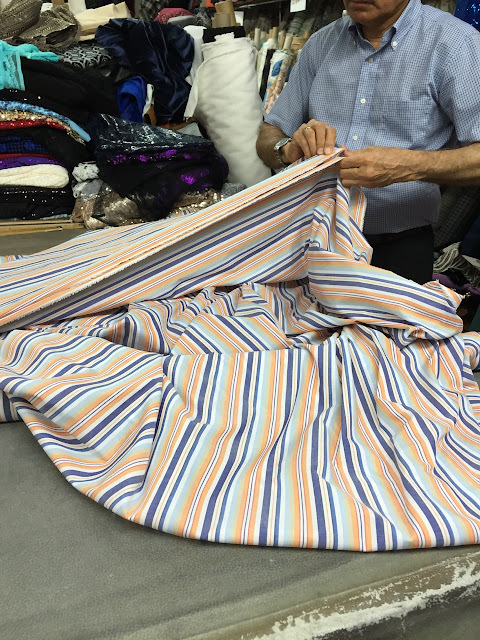 If the muslin is off-grain, we pull the corners to straighten it out and press the muslin with a hot iron. 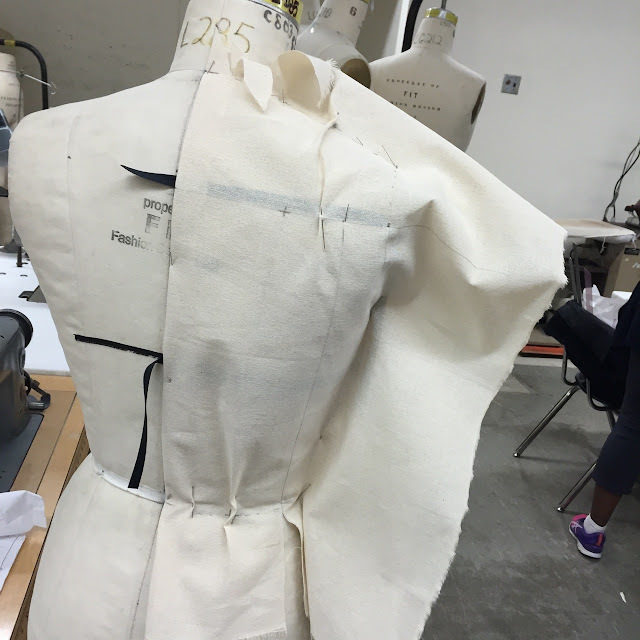 We draped the front bodice first and then added the back. In pencil, we marked cross marks where darts begin and end, and dotted along the important edges (like armhole, neckline, etc.) 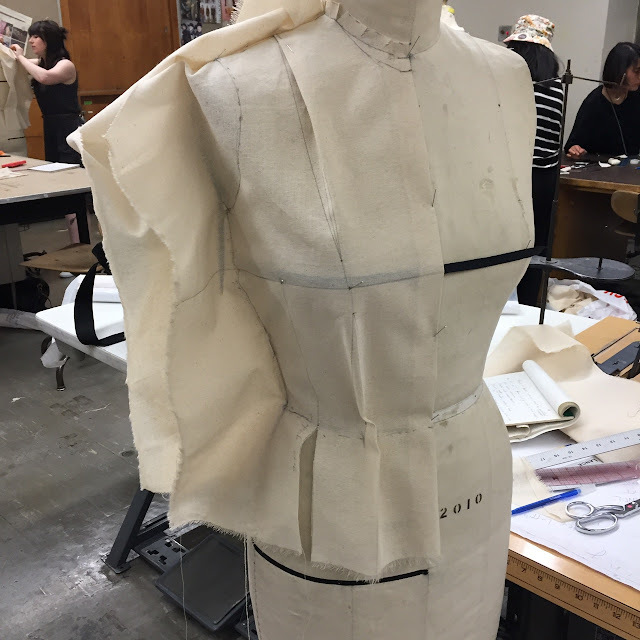 We must record all the necessary information on the muslin so that we can remove it from the dress form and transfer these measurements to a paper pattern. We true our edges with the aid of a French curve and hip curve. That means we connect the pencil dots we drew (on the waistline, for example) to create a smooth curve. 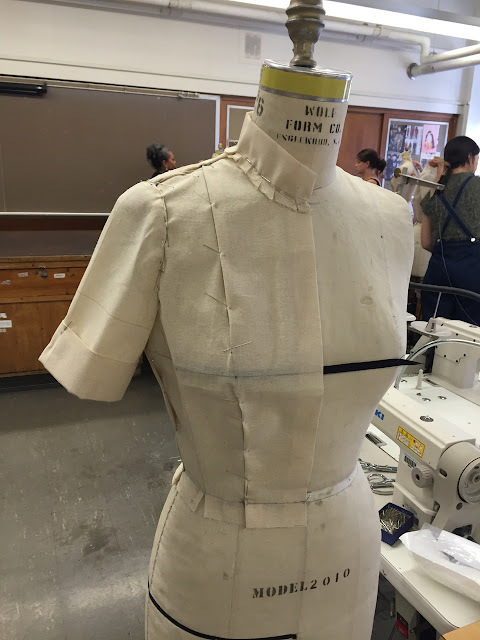 We added seam allowances to our muslin and cut off all the excess fabric. 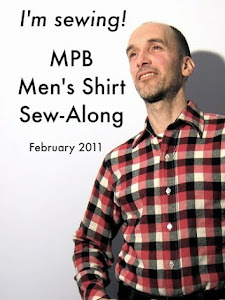 We drafted a simple collar and, using a standard sloper, drafted a simple short sleeve with cuff. We then cut these out of muslin and pinned them to our bodice. 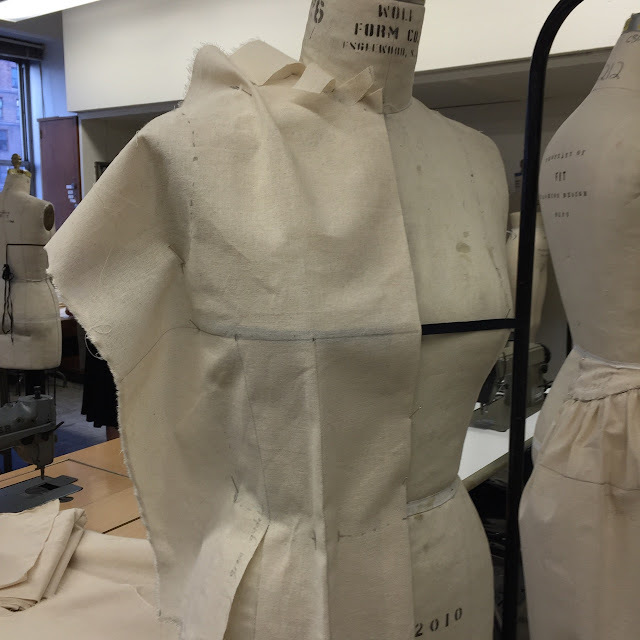 Once we made sure our bodice fitted accurately, we traced our muslin onto paper and created an oak tag sloper. 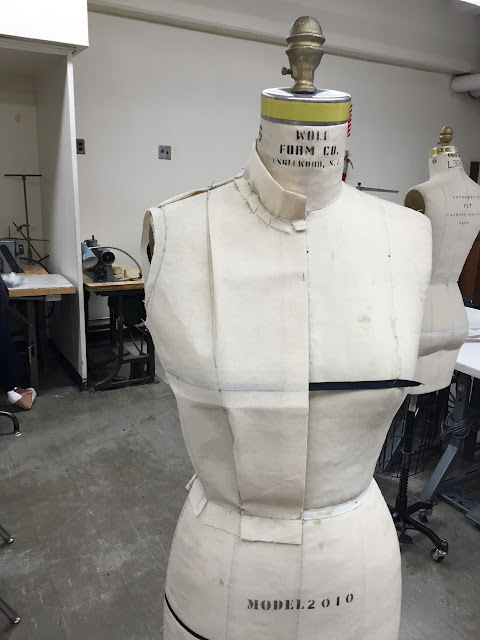 I bit the bullet and purchased Draping for Apparel Design. It wasn't required by our professor but she did recommend it and I think it will be a useful resource moving forward. 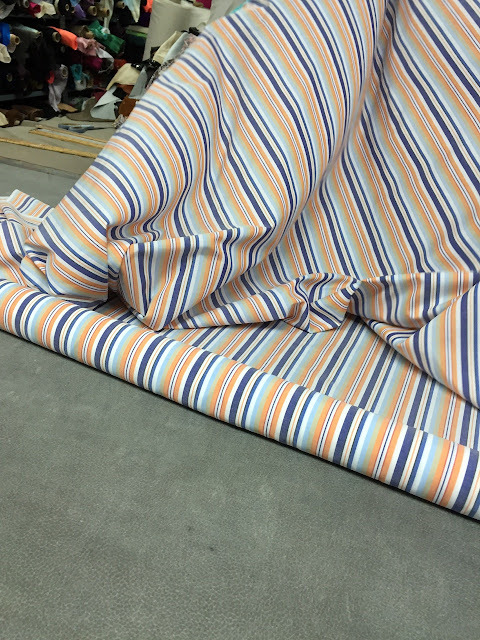 I mentioned in an earlier post that our final project will be a striped dress we drape ourselves; yesterday our professor encouraged us to buy our fabric soon. 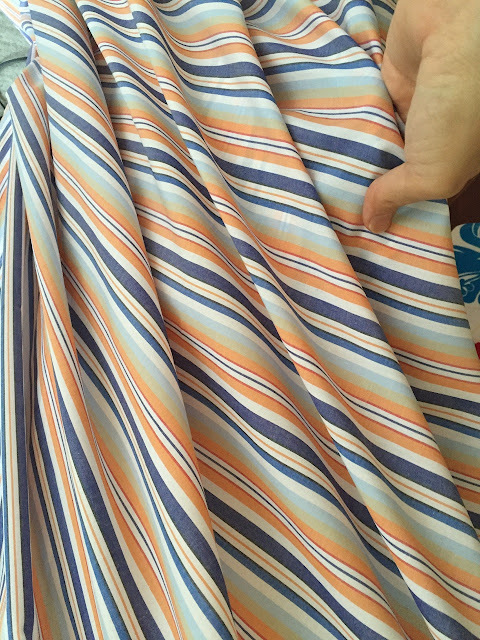 I hightailed it to the Garment District and, after looking at dozens of different stripes, picked up a summery multi-colored cotton stripe at Chic Fabrics (which shares a space with Fabrics for Less) for $4.99 a yard. That's about as good as it gets these days. It's pretty, no? And that's it. I haven't been sewing as much as I normally would but I do have some projects I need to get cracking on: I have high hopes for weekend productivity! That fabric was a steal!! It could chevron quite smartly. Michael could use a light summer jacket, for those "swanky supper clubs" you two frequent when on vacation (and in town). 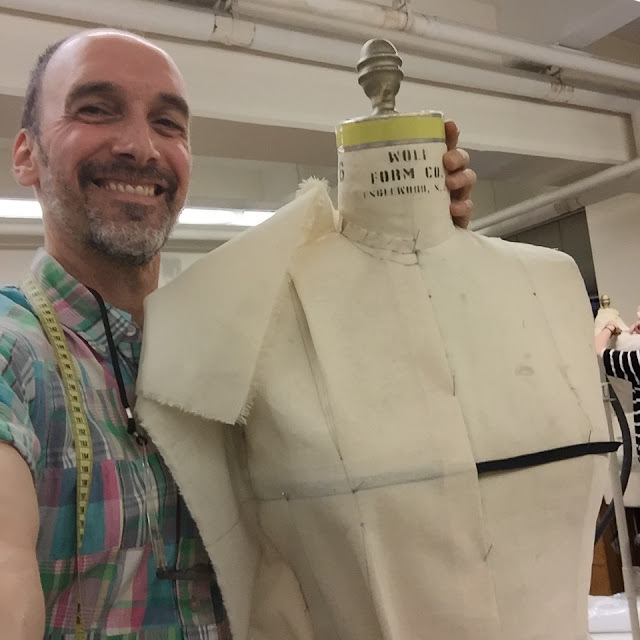 When I first saw your final fabric, I thought, "How does he do that? All his stripes look like men's shirts." 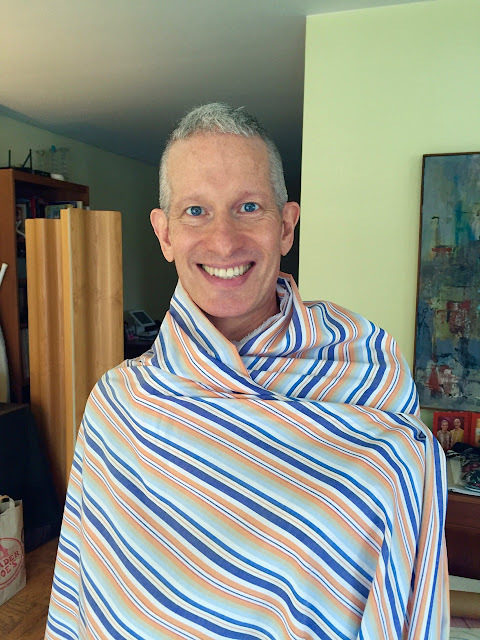 And then I got to Michael modeling the fabric: Score!! That fabric really looks great on Michael. 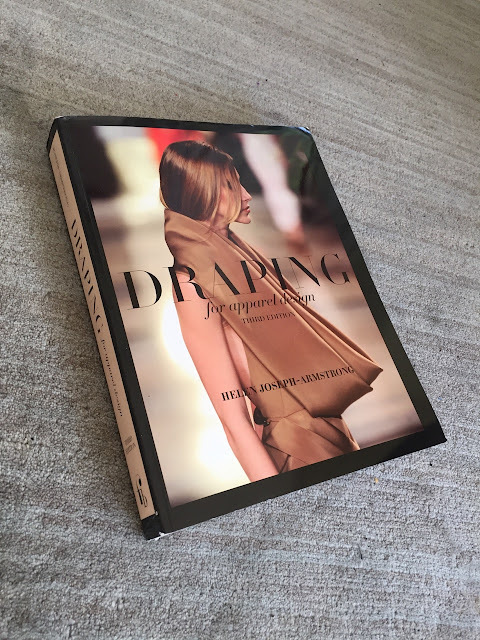 That draping class sounds fun as well as challenging. Who will receive the final garmet? 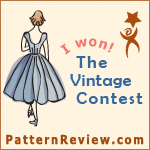 Love the fabric and the class sounds like it is fun! Great fabric choice. It has a 'enjoy a Creamsicle while at Cape Cod' feel. Who will be your muse -- Cathy? For the heck of it, I just ordered an earlier edition of the Armstrong for under $12 w/ free shipping. I wonder if there are significant differences between these editions. I doubt it's radically different. Enjoy it! Thank you! You're using terminology that I don't understand so it will be great to follow along with an appropriate text. Michael's hint dropping technique is not very subtle, is it? The stripe is perfect for him. Very interesting--thanks so much for sharing. Just wondering...how much seam allowance did you add? Half an inch on curved seams and one inch on straight ones. It sounds like you're in your element! 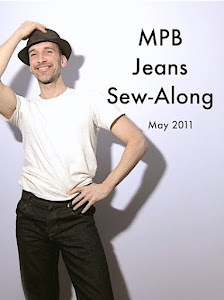 I'm with Michael - he need's a shirt in that fabric! How long is the piece of fabric that you block? For the bodice, 15" x 25". I am absoloutly jallous about this course! Unfortunately, we don't have such a course here. I baught a Dutch book on Moulage techniques but still have to start experimenting. 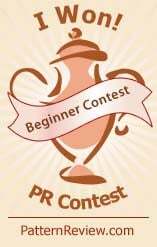 Can you recomment the book you mentioned in your blog entry? I haven't really used it yet but it's the recommended text for the course and has excellent reviews on Amazon. Fascinating process! Thanks for sharing this. Also, I love the stripes! I like! That bodice looks great. Looking forward to seeing the final project!